There is that moment you have once you have a kid when you wonder what life was like before the little one was around. You can’t even remember those days anymore. Surely we have always been a family of 4. I had one of those yesterday while putting little lady’s 5 month sticker on her outfit. When had this happened? She can not be that old yet. I just had her! And while I admit I miss those precious newborn days when it was just her and I in the living room while I was on leave, at the same time. I am loving this moment. This month has seen a lot of big changes. Her giggles are becoming more infectious with each passing day. Gone are the accidental giggles. They have been taken over with a cute little baby chuckle that has grabbed the heart and the attention of anyone willing to listen and play along. She could also babble all day to daddy, Logan and myself. At times, they are so deep and serious almost that I often wonder what is going on her little head of hers. Yet at the same time, a minute later she is all smiles and sweet talking you like a champ. Even if it is in her own baby language. We’ve also noticed how much more alert and aware of things she has become. No longer does she like to be held so she can’t see anything! And if you put a hockey game, or a baseball game on she is glued to the TV. You can pretty much forget tummy time these days. She was never a fan of it to begin with but lately she has figured out to roll from her tummy on to her back, though she has yet to master the other way around. She will get there. And sitting up? You can tell she wants to sit up a lot more these days. She may not be able to sit unassisted yet, she is working on it. Getting stronger by the day, it has been incredible to see her reach each new thing or milestone every week. She has also discovered her wonderful little hands are probably the best chew toy ever. While she does not appear to be teething yet, she is definitely getting a work out on those jaw muscles. Harper had to undergo a ultrasound for her port wine stain on her foot. Everything turned out fine and it only seems to be superficial at this point which is good news. It will still have to be monitored and evaluated to make sure everything is all right still, but for the moment it is good news. And lets hear it, she is finally in 0-3 month clothing! Most are still a little big but we are glad to see that she is moving in the right direction. It also means I should probably go through those drawers and change out to the bigger sizes we have been hoarding for awhile now. 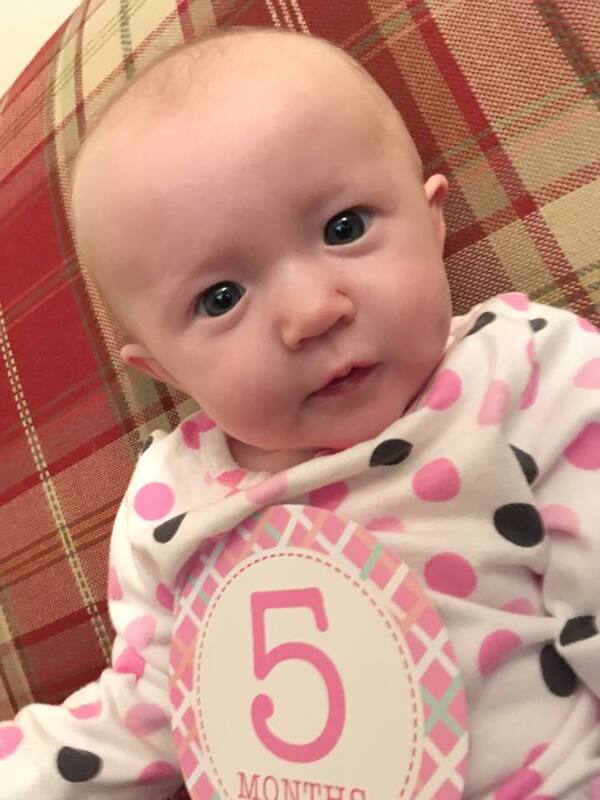 I find it hard to believe that a month from now she will be six months old! Honestly I am really beginning to wonder just how that happened. And yet, I can not remember a time when she was not part of our lives. Much like it was with Logan, she seems as though she has been part of the family forever. Here is to 5 months! Tonight brings Game 6 to us from Pittsburgh, and I have a big decision to make. Yes I know, what kind of fan am I if I don’t right? After all its the playoffs, and I know I should watch it. I know I should support the team and all. And yes I do. I love watching them, I love the hits the shots. The back and forth between these two teams. Its fun, its exciting and like it was on Saturday, a win is exhilarating. Its the the thought that if we win tonight we can bring it back home for game 7 on Thursday. It would be a comeback for years to come. So why shouldn’t I watch? Yet, it is also emotional. It is hide my face under my hoodie with each goal that we get, it’s nail biting. It’s trying to stay cool and ignore each outburst that my husband does. If it is hard to watch as a fan, it is even harder when your husband is part of the organization. This is his job, his team. What they do depends on what he does and how he feels. While he may not agree with this, he does not realize how emotional he gets, yes I am speaking of the hockey PMS. During playoffs it can be like riding a damn roller coaster. Believe me I fear our furniture will not survive another round if it is going to be like this. And its knowing that if it all ends tonight, that I will have to listen to days of doubt, question and blame. I will have to come in to the office to coworkers who will no doubt want to discuss it with me-because somehow I get to be held responsible for their wins and losses- when I would rather be discussing anything other than hockey at that moment. Believe me I do not look forward, nor want to have these discussions. And I will not even begin to go on about the oh so wonderful commentary from certain commentators. Because yea, lets just not get me started on that one. Since I have some strong words on the topic. Perhaps the safer option for me in regards to it is to let my husband watch it from downstairs and do all the yelling he wants while I barricade myself up, upstairs while listening to the game on mute.